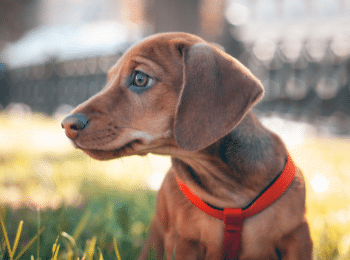 Dachshunds have long backs, short legs, and a puffy chest, so it can be tough to choose the right dog harness for your doxie. No worries, we can help you find the perfect harness for your dachshund. After a good amount of research, I was able to find the best dog harnesses for doxies. The ChokeFree Velpro Mesh Pet Shoulder Harness Collar is my number one choice. 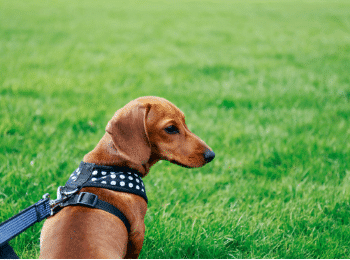 The best dachshund harness is designed to reduce any strain on their neck and redistributes pull pressure across their body. While hiking with my two doxies, Reno and Bastian, I noticed that Bastian tended to pull so much that his neck collar would tend to make him cough and hack. He loves to walk, so he literally helps pull me up the big hills during the hike. Reno was a little slower on the hike, so he didn’t have any issues with pulling. So, I decided to try a body harness for Bastian. That was the best solution for him. No Pull Harness: This type of harness will tighten slightly when your dog pulls on the leash. The pull is felt under the dog’s arms and chest instead of around his neck, unlike no pull dog collars. Pay close attention with this type of harness to make sure it is comfortable and won’t cause any irritation under the dog’s arms. Look for soft comfortable material to prevent irritation. Proper Fit: It is important for a dachshund harness to have a proper and comfortable fit to allow the dog a good range of motion. 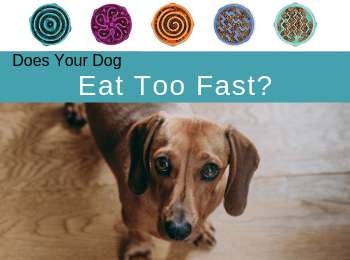 To check your dachshund’s size, measure his neck size, the girth around his chest (widest part of his body), and his length from his neck to the top of his tail. 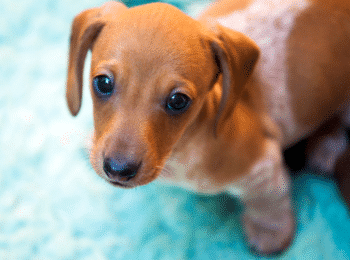 Standard Dachshunds average 8-9 inches tall and can weigh up to 32 pounds. Miniature dachshunds are usually around 5-6 inches tall and weigh up to 11-13 pounds. Mesh Harness: On hot summer days, Mesh is a great material to keep your doxie cool. But, make sure to pick higher quality mesh harnesses because the cheaper mesh durability isn’t as strong as other harness materials. Nylon Harness: This type of material tends to be less expensive than most. They are easy to clean and come in many bright colors. They tend to be a little more durable than the mesh version. Fabric Harness: There are so many cute fabric dog harness designs available. They tend to be pretty easy to clean. Their main purpose though is to dress up your doxie, not necessarily to be an active harness for daily walks or hiking trails. Leather Harnesses: A nice quality leather harness may cost a little more than other harnesses, but they are so much more durable and flexible. As long as it is good high-quality leather, it should be a comfortable long-lasting choice for your dachshund. Back Support Harnesses for Doxies: This type of harness will support a dachshund’s back, and is special for IVDD conditions. It will extend farther down the dog’s back and give more back support. This special harness also usually comes with a supportive handle on the back to help lift the whole dog if needed. The Choke Free Velpro dog harness is made of cooling mesh material. This is a one piece, non-choking dog body harness that has a special Vel-lock closure. It comes in many colors and sizes that will fit dogs who measure 11 inches up to 20 inches around the chest. They recommend measuring the dog’s chest just behind the front legs and going up an inch to allow for maximum comfort. The material is lightweight, soft, machine washable, and Easy to put on (YEAH!). Its main support is around the dog’s chest, so, no more choking on those fun walks. This is a great choice for dachshunds! This no pull harness is EASY to put on and take off small dogs, like dachshunds. It is full of comfortable soft padding (interior and exterior) for your dog. It is made with special “Metric 66” material that provides a comfortable hugging effect to the dog and will reduce the stress and tension when you take your dog for a walk. The special padding decreases the strain on the lower neck and throat caused by pulling. This harness is washable, breathable, and lightweight. It is available in several bright colors and comes in many sizes. The Puppia Dog harness is made of mesh/polyester material for extra comfort. They come in lots of fun colors and many sizes. The soft mesh design is durable and easy to clean. It is great for those hot summer days or those muddy winter walks. It is super easy to put on your dog (no more wrestling with your dog to go for a walk). It is choke free and is made with soft and breathable material to prevent irritation of your dog’s underarm skin. This dog harness is tough and super unique. It is specially made for strong Pullers! It is built for those more rugged walks and hikes in the wilderness. It has a front leash attachment that encourages dogs to keep up the pace with their owners. It is designed to redirect dogs that are pullers and keeps them facing forward. It also has a back leash attachment. This harness is lightweight, durable, and designed for easy on and off. Super padded for lots of comfort and includes reflective trim to help your dog stand out day or night. It also comes with a cute ID pouch for safe storage of your dog’s id tags. The Embark Adventure harness is EASY to put on and take off of your dachshund. Note: It does not fit extra small dogs under 10 pounds. It has a couple of color and size choices. This is a No-pull dog harness that is durable, flexible, and comfortable for your dachshund. It is made up of no-rip nylon and anti-chafe padding. It also has compatible seat belt attachments. It has a no pull front lead leash attachment point that is very strong. This allows your dog to learn how to stop pulling and heel during your daily walks. It still has a back leash attachment as well. This also comes with a 100% satisfaction guarantee. It works great on all shapes and sizes. This harness is compatible for smaller breeds: Beagle, French Bulldog, Yorkshire, Boston Terrier, Dachshund, Miniature Schnauzer, Cocker & King Charles Spaniel, Pug. The EcoBark Harness is a No choke and No Pull Harness. EcoBark’s Best Selling Eco-Friendly Harness, made from ROSH Tested, not toxic meshing and nature-friendly strappings created from recycled water bottles. The Harness Hug is available in 9 different colors and 5 sizes. Ultra Soft and Highly Durable. Eco-Friendly No Fade Straps Made from Recycled Water Bottles. Innovative No-Choke design protects your dog’s fragile trachea and throat with extra plush piping around the neck opening. It is great for walking, running and hiking. The harness will hug the dog with a Flexible Air-Mesh which Maintains your Dog’s Natural Movements. 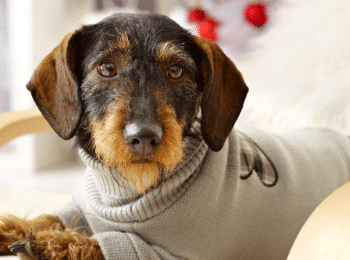 Here are some more great options for Dachshund Harnesses. Some are even custom made. Let me know what you guys think in the comments. What dog harnesses have you used for your dog?